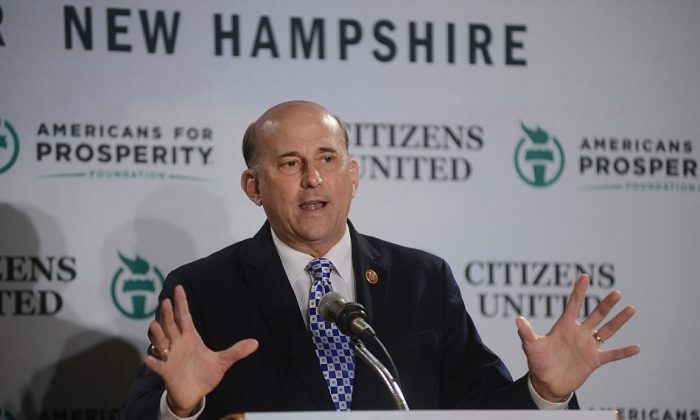 Rep. Louie Gohmert (R-Texas) said Sunday he would run for Speaker of the House against incumbent John Boehner (R-Ohio), who has been criticized by the conservative wing of the party for advancing a center-left agenda. “Cromnibus” is the name D.C. insiders have given to the $1.1 trillion spending bill passed by the House on Dec. 14, because it includes spending bills to fund most of the government through September 2015 (an omnibus spending bill) and a continuing resolution that funds the Department of Homeland Security through March. Homeland Security is singled out for a shorter funding period because Republicans want the chance to revisit funding President Obama’s policies on immigration. The conservative Gohmert was among the 67 Republicans who voted against the cromnibus on the grounds that it took away their leverage in the coming year to reverse the Affordable Care Act (aka, Obamacare) and President Obama’s executive order giving legal status to certain classes of illegal immigrants. Rep. Thomas Massie (R-Ky.), Jim Bridenstine (R-Okla), and Ted Yoho (R-Fla.), and Paul Gosar (R-Ariz.) have joined Gohmert in opposing Boehner for the House leadership, citing mutual discontent with Boehner’s role in passing the spending bill and brazen treatment of rank-and-file members. “Speaker Boehner went too far when he teamed with Obama to advance this [Cromnibus]. He relinquished the power of the purse, and with it he lost my vote,” Bridenstine said in a statement. Yoho has also offered himself as an alternative to Boehner. A bare majority of 218 votes is required to elect the House speaker, so that if at least 29 out of the House’s 246 Republicans vote for someone other than Boehner, the House will go into a brokered conference meeting and further rounds of votes until a majority vote is reached. Repeated roll calls to elect a speaker are a historical anomaly, with the last one dating back to 1923, when nine rounds of votes occurred before a speaker was elected. Further back in history, the 31st Congress in 1849 took three weeks and 63 rounds of votes to elect Speaker Howell Cobb. If at least 29 Republicans withhold their votes for Boehner, they can effectively negotiate for concessions with the future leadership unless Democrats fill in the missing votes. The conservative group FreedomWorks launched a campaign this weekend to have activists—it claims a community of 6.7 million—contact Republicans in the House to vote against Boehner on Tuesday. “Speaker Boehner has kicked fiscal conservatives off committee positions for voting against his wishes, caved on numerous massive spending bills at the eleventh hour, and abused the legislative process to stomp out opposition by holding surprise votes and giving members little time to actually read the bills before they vote,” FreedomWorks president Matt Kibbe said in a statement. Gohmert cited popular dissatisfaction with Boehner as another reason for his run for speakership. A poll of 602 Republicans by Caddell Associates in late December found that 60 percent of Republicans either “definitely” (34 percent) or “probably” (26 percent) want someone else as speaker, and only 25 percent would vote to re-elect Boehner. The first vote for the speaker takes place Tuesday.